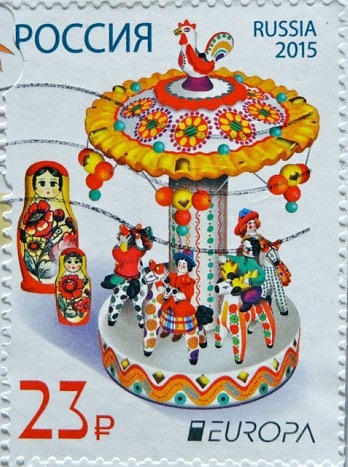 The Europa stamp competition theme for 2015 was of “Old Toys” Russia's stamp shows Dymkovo toys and Matryoshka dolls. 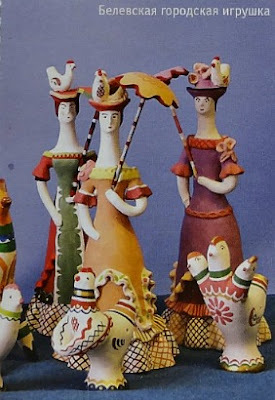 Dymkovo toys (also known as Vyatka toys or Kirov toys) are molded painted clay figures of people and animals. It is one of the old Russian folk arts which still exists in a village of Dymkovo near Kirov (formerly Vyatka). 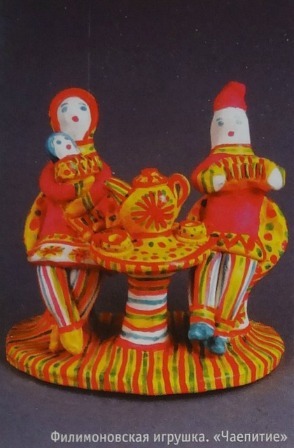 Traditionally, the Dymkovo toys are made by women. This sender also included some postcards showing the toys. For me, personally, I don't particularly find the these dolls attractive – and I'm not sure how much time would be spent playing with them – but I am quite fond of the matryoshka dolls. I had one as a child and I remember many hours of amusing myself taking them apart and moving them around into different displays. A matryoshka doll, also known as Russian nesting doll, refers to a set of wooden dolls of decreasing size placed one inside the other. 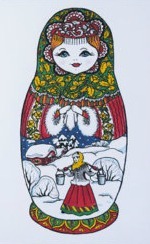 The first matryoshka dolls were made in 1890 by Vasily Zvyozdochkin. 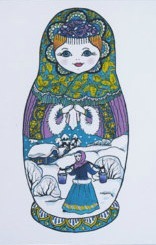 Traditionally the outer layer is a woman, dressed in a sarafan, a long and shapeless traditional Russian peasant dress with the figures inside of either gender. The smallest, innermost doll is typically a baby turned from a single piece of wood. Much of the artistry is in the painting of each doll, which can be very elaborate. That stamp is really beautiful. The Russian post office often surprises me. Beautiful! Indeed Russia has many colourfull stamps. The 2015 stamp is superb. My Russian stamps are anything but colourfull, not that I have many at all. I like the hens nesting in the hats on the PC, so funny. The roundabout is pretty and another hen makes an appearance. Maybe they are clucking around while they make those toys. I agre with the previous comments: it is a beautiful stamp indeed. I'd like to have one of these Matryoshka doll one day! I've been to Moscow this summer and I was amazed at the variety of matrioska dolls at the 'Izmailovsky market (I wrote about this market and the dolls in my blog).